Land Rover will inject some new life into its iconic Defender by unveiling two new option packs at the Geneva Motor Show. The Black Pack and Silver Pack will be available for Defender XS models and add a number of visual enhancements, such as leather seats, black alloy wheels and privacy glass. Land Rover hasn’t announced any prices, but the new packs will be available in the UK from September onwards. The Black Pack adds a Santorini black finish to the roof, grille, headlamp surrounds and wheel arches. The pack will be available with two wheel variations – a gloss black alloy wheel and a new gloss black heavy duty wheel. The Silver Pack will include a bright silver finish to the contrast roof (either body colour or contrast), which is complemented with the same finish to the grille surround, headlamp surrounds and facia. The vehicle also features the dual finish alloy wheels as standard and white tail and indicator lights. As well as two new packs, Land rover is expanding the options list for the Defender, with privacy glass, contrast leather premium seats and three new paint schemes. 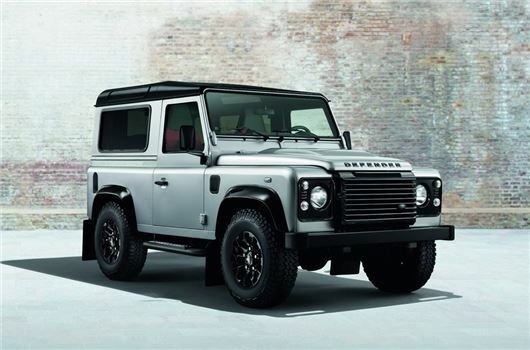 It has also announced that the Defender 90 and 110 will be fitted with ABS and Dynamic Stability Control (DSC) as standard, while ABS will also be available for the first time on all 130 wheel base Defender models from September onwards.